This property is a 3-minute walk from the beach. Situated in Nha Trang, Nagar Hotel Nha Trang provides 4-star accommodation with private balconies. The property has an infinity swimming pool, as well as a restaurant serving international cuisine. Attractions in the area include Sailing Center Vietnam and Sailing Club, a 5-minute walk away. All rooms in the hotel are equipped with a kettle. Complete with a private bathroom, the units at Nagar Hotel Nha Trang come with air conditioning, and some rooms have a seating area. At the accommodation all rooms have a desk and a flat-screen TV. Spa and wellness facilities including a sauna and a fitness centre are at guests’ disposal during their stay at Nagar Hotel Nha Trang. Staff at the 24-hour front desk can lend a hand with guidance about the area. 2/4 Square is a 7-minute walk from the hotel. Cam Ranh International Airport is 25 km away. 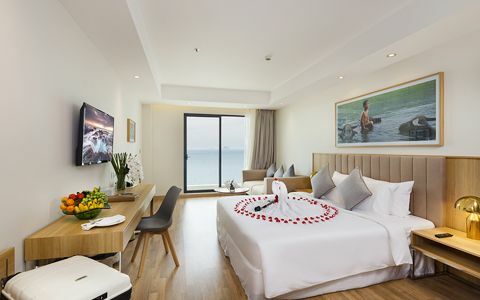 Situated in Nha Trang, Legend Sea Hotel offers modern and elegant accommodation with free WiFi access throughout the property. This property is a 5-minute walk from the beach. Edele Hotel is set in the heart of Nha Trang only 400 m away from Nha Trang Beach.